I've been working on a few projects here and there, adventures that I hope to put up as a PDFs eventually. Some are nearly done, some long overdue, some new and barely outlines, but one of the things I have been focusing on is improving design and usability. My past adventures, especially early ones like Obelisk of Forgotten Memories have a lot of content, but they are a bit of a mess. I've been trying to improve the layout and utility of what I write and I think I have made some improvements. The description box, encapsulating smell, lighting, treasure and perils in a given location is a good addition I think, as it provides at a glance what a GM needs to know to run the room, or better to job then a memory of the room description that the GM previously read might do alone. With a personal solution to this basic location description in place I've been thinking more about the larger issue of scenario design, and the weaknesses I find when reading published adventures, specifically the B-series of modules, specifically the introductory hook and the rumor table. Hooks and rumors are pretty integral to motivating players to explore a location, and the difficulty in creating them is I believe one of the problems with sandbox play that leads to railroad adventure design. This can be ameliorated by having a ton of content available or by making hooks and rumors more interesting. First it seems that there has been a distinction recognized between hook and rumor, the first being why the adventurers are seeking out a location, and the second being what they might learn about the location prior to adventuring there. I'm not sure this is a valuable distinction. Hooks are usually provided as narrative, a page or two of why a group of adventurers would be compelled to go someplace, or want to. This seems excessive as players will often go where the GM hints they should go, unless the game world has given them their own agendas already. That is to say "There's a tomb rumored to be full of money outside town" is often enough when the game world is young and bare, while even a patron demanding that the party explore a tomb full of money to save the world won't be met with enthusiasm once the game world has developed a good deal of richness, and the characters have their own agendas. Longer, more complex hooks should really be role-played out at the very least and demand to be incorporated into the game rather then simply sprung on the players. If the evil of the week is going to kidnap the players' favorite NPC, let them have some say in this, even if the kidnapping fails the players will likely motivate to retaliate. This isn't to say that sudden world shaping events (A meteor full of vampire elves crashes into town) aren't legitimate means of creating an adventure, but not every hook can be sudden, unavoidable and monumental. Really in a sandbox game hooks can be dangerous. If player freedom is the goal, having elaborate or forceful hooks (i.e. "Allow me, the GM, to read this three page story about how the party wakes up with evil blue tattoos that compel them to do bad things or suffer!") will make your sandbox rather railroady, as the hook must be dealt with first, and if it's the "Curse of the Azure Bonds" it's going to take up most of the campaign, making all the extra locales and such the GM has designed pointless. For sandboxes, simple motivations (locale power and money) seem to work best and so hooks can be simple rumors about the locations of treasure. 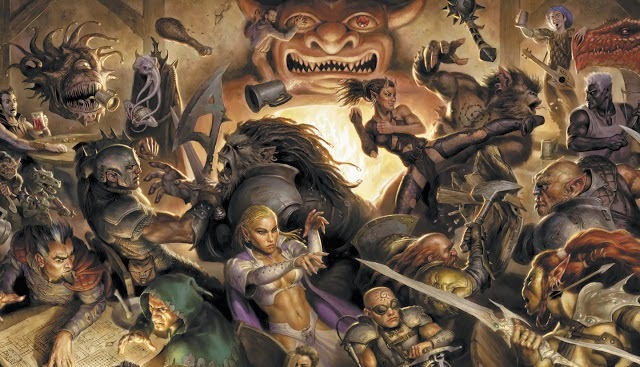 Still, rumors aren't traditionally hooks, they are traditionally something extra that the GM hands out to create a bit of flavor, warn against special threats or get the players more excited about the adventure locale. My favorite old B-series rumor is "Bree-Yark is goblin for I surrender", an entirely false rumor from Keep on the Borderlands. It's a terrible rumor as it is false, and there's no point to false rumors except to trick the players, and likely teach them never to trust rumors. This isn't to say false rumors should be completely abandoned, only that when giving false rumors there should be a way of determining falsity and some consideration given to the use of the false rumor. There's a couple ways of doing this, an internal inconsistency or an external one. In the first case there's the rumor "no-one has returned from the Caves of Chaos alive as the manticore gets them!" This is clearly a false rumor and should be ignored because if it were true about there being no survivors, who mentioned the manticore? The players should easily figure this is an entirely useless rumor. Yet why give an entirely useless rumor, it just wastes time. Am extrinsic error would be some fault of the narrator that indicates a problem with the rumor. If a local bumpkin says that all the doors on the to the Caves of Chaos are locked with unpick-able wards it means a only that there might be some locks, but if a magsman in good standing says the same, maybe knock is a necessary spell to get into the caves. Likewise a false rumor may be interesting or useful if the provider of the rumor is an important NPC or reveals the extent of a faction's knowledge. For example if the entirely absurd rumor that the orcs in the Caves of Chaos are in league with the church is spread by the Keep's guard it reveals a certain fracture between the church and the secular authorities. There are two issues here, the importance of rumors depending on the nature of the rumormonger, and the use of simple hooks unless they are part of the adventure itself. If the traditional hook as narrative (in at least a simplified form) and the random rumor table can be combined for a good effect, that saves space, allows multiple hooks, makes in town interaction more interesting and helps keep the possibility of false rumors (or partially false rumors) open. Below is a rumor table I just created for an upcoming project. A grizzled fifteen year old former pickpocket, fingers hammered and twisted into uselessness. The Road of Tombs is the place to go on the lam, there’s plenty of hidey holes and if you go far enough out not even the enforcers will find you. A ragged house breaker, her eyes wide with dream berry and her hands twitching. There’s something real down the Road of Tombs, it’s the wilderness, but it’s calling to me now, a land of true comrades and the balancing of the scales. I’d go but my job is here. A soberly and meticulously dressed professional guide for the slumming gentleman. The Bawds have been having trouble of late, disappearances from some of the outer crypts, I bet it’s some crime king, trying to scare them into working for him. Little chance there. A matron, dressed in sober black with a grey stone skull mask and pin designating her as a professional tomb robber. The Road of Tombs is picked clean, anything left is trapped, wyrded, guarded or ensorcelled. Even commoners’ ash jars will sometimes contain ember geists, and the tombs of the ancients, I didn’t get this old by playing with that kind of magic. A portly fence and boaster for the Crime Kings, wearing a red sash of office and the smile of a cannibal hog. Boss Dixson has put up an honorarium of 500 GP for any who can trace what happened to the lads he sent to the Massif. We know the gladiators at the Bawd’s Market are behind it, they aren’t real thieves and have no sense of propriety or honor. An elderly confidence man, still attractive in a leathery way, but seemingly retired and dressed in a patched merchant’s suit. The Road of Tombs was the way out of town fast when I was in the game. There was a necromancer at the Massif, something Vex. You could trade him a blown horse for something that would ride like the devil until the sun came up, hell of a guy. A scarred pit fighter, having trouble drinking through the grill of the elaborate bronze helm bolted to his neck. Gladiators all hope to go to the Bawd’s Market after the pits, take a few clients, instruct them in fighting or pleasure, whatever suits a gladiator. It’s worrisome though, the Bawds claim they are losing custom and their own people in the night. An assassin, or something equally dark, her face covered in tiny tattoos, and her right hands a magically animated steel talon. Smuggling is weak craft, the weak are smugglers. The gods say they should drown in their own blood, and that is what is coming along the Road of Tombs, a reckoning in blood. I know how to stay before the tide – do you? There are a couple of things at play in this table. First the rumors are all true, and the nature of the teller indicates a bit about the context of the rumor, giving clues about faction relations in town, and potentially in the dungeon. Second it allows me to lead to certain hooks if the party wants to follow up on them, or directly offer missions as part of the rumor discovery process. Last note that this is only the "Thieves' Rumor Table", for characters who decide to seek information in the underworld,there are a couple of others in the adventure, one for more respectable types who ask the merchants and another for those who don't focus their inquiries and ask about haphazardly. While the rumor providers and rumors are lined up more or less in the above example, they could be rolled separately, allowing the GM to give more then one spin on the same rumor. It is surely possible to take this further, making the rumor table into a full fledged in town random encounter table, perhaps linking it to carousing or as an automatic in town action. I like. I can envision a table where there are rumors and gossip based on types of activity the players are engaged in. The washwomen by the well are goign to have different tales than those spoken by the caravan hands that came in yesterday. I like this a lot. I've been making "stacked" rumor tables lately, but they are a lot of work. Essentially, a rumor, and then additional information if the party spends time/money researching (and often where, specifically, they can find the information). I like the rumor table, but I've got to disagree with you about the entirely false rumors. Sometimes the false rumors can be told by someone who's intentionally lying to the party, sometimes it can just be wild misinformation by someone who desperately wants to be helpful or seen as someone in the know (especially when they aren't). It isn't just the DM tricking the players... or it shouldn't be. I'm with you there - that's not an entirely false rumor, an entirely false rumor per my definition above is one that is useless and has no context. Context is best provided by having a speaker involved and a bad rumor that shows information about an important speaker isn't false. i.e. "Bree-Yark" is a false rumor and bad for my game if provided as part of an info dump "These are the rumors your party knows", but it's damn useful if the evil priest tells you, because when it's proved dangerously false, perhaps it acts as a warning about his intentions. Yes, I see what you mean. The info dump rumor should be avoided in general, and a completely false rumor should always be avoided in an info dump. I do think that in a Keep on the Borderlands type situation, the giver of the false rumor could change things up. Imagine if the evil priest was a shop keeper, or the castellan, or the stable boy of the guard captain depending on how the adventure rumor table turned out. It really depends on how much one role plays the "town phase". Of late I really prefer to deal with many downtime/town actions "off camera" and some systematizing is useful as this saves time to actually delve dungeons and such. Linking rumors to NPCs is a good step. I never really thought about the difference between Hook and Rumor. Any rumor can get the Heroes moving.